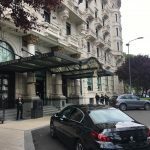 Completed our customers trip to Excelsior Hotel Gallia, Milano. We can arrange your transport, be it business, leisure trips or special event. Book yours now by calling us or filling the booking or contact form on this website. Book your private driver for all your trips on the French Riviera. Réservez vôtre chauffeur privé pour toutes vos déplacements sur la Côte d’Azur. Posted in Transfers and tagged airport transfer, transport, vtc.